It’s not like you threw a D-Cell, Steinberg, right? Sure, it’s generally the rule that a journalist should not show they are rooting for one team or another in their work. But, I kind of feel like Philly’s major paper has maybe given Steinberg a little room to maneuver here… “Philadelphia Inquirer Encourages Fans To Throw Batteries At Boston’s J.D. Drew“. That’s our new WAKA Kickball flyer, promoting the upcoming summer kickball leagues. Check out a WAKA league near you and get signed up. Check us out on Facebook too. On April 1, we were at 9,696 fans. As of right now, we’re at 11,644. So that’s almost 2,000 new fans in less than two months and I’m definitely excited about it. Facebook is a huge referrer of traffic to kickball.com and our players are great about posting things like pictures from the field or information about their league’s charity efforts — a co-worker at WAKA just sent me a stat the other day that WAKA players have raised over $1 million for charity in the last four years alone…pretty amazing. Speaking of charities and kickball, check out this video for Kick-It, a children’s cancer charity that WAKA works with. They hold kickball games to raise money for their cause and were founded by a 10 year old cancer patient. This is great! According to the Yahoo Sports Shutdown Corner blog, David Bruton of the Denver Broncos is spending the NFL lockout working as a substitute teacher in his home state of Ohio. It’s nice to hear an inspiring story like that. And nice job by whoever initially put the spotlight on this and got it some media attention. I’m happy to see Bruton is getting some recognition for choosing to do this with his time. Check out this video from Kick-It, a non-profit that was started by a 10 year old cancer patient named Quinn Clarke. Kick-It raises money for children’s cancer research through charity kickball games. They are trying to get 2,000 views of the video below by the end of this week so they can win a donation of $6,000. All you have to do is watch it to help a great cause! Please check it out and pass it along to others. Thanks! Will Jiffy Lube Live’s new tailgate policy make the roads safer or just shift the problems? Northern Virginia concert venue Jiffy Lube Live (formerly Nissan Pavilion) has banned tailgating in their parking lot, in “an effort to stem drunken driving, which, in the past two years, has taken four lives after concerts,” according to an article by Chris Richards in The Washington Post. As the Post article shows, some people aren’t happy about this policy and that’s understandable. Tailgating, and the excessive drinking that can come with it in some cases, is a huge part of concert culture for numbers of people. Or others like to arrive before the bulk of the traffic, to ensure they don’t miss any of the show, and want to responsibly enjoy food and drinks while they wait for the venue gates to open. And some concert-goers that tailgate don’t get so out of control that they can’t drive home, while others bring a designated driver or hire a bus/limo/etc. There are no doubt a lot of people upset that these various tailgate experiences are being taken away from them. Knowing they can’t drink in the parking lot, some people might consume more before they get in their car to head to the venue for the show, which would just mean more drunk drivers on the road at a different time of day. Another way to put it: people will pre-game before they drive to the venue, rather than tailgate in the parking lot. Unable to drink in the parking lot, people might consume more once inside the venue. And any patron taking a catch-up approach inside the show because they couldn’t arrive early and tailgate would be drinking more alcohol closer to the time they’ll be getting into their cars to drive home—a let me have a few drinks at the tailgate and then sober-up inside the show technique no longer works as well. The Richards article mentions “chugging throughout the concert instead of beforehand” being a concern of some posters to the Jiffy Lube Live Facebook page. It’s also at least worth noting, as a Facebook fan in the Post article and many others have pointed out, that Live Nation benefits financially if beer sales in the venue rise because people can no longer get away with drinking in the parking lot. I’d love to see any research that shows whether or not tailgating-bans lead to less drinking or if it just shifts where and when that drinking takes place (please email me or post comment if you know of anything like this). The Post article also says, “Parking lots will open later than in the past, generally one hour before the venue’s doors open.” As someone who usually avoids Jiffy Lube Live because of the traffic nightmares that already exist there, I cringe thinking about what effect this narrower window could have on those trying to get into the venue or on non show-goers sitting in rush hour traffic. Without seeing any research, it’s hard to tell if a tailgate ban really will result in fewer drunk drivers on the road for Jiffy Lube Live shows when you factor in shifts in when and where the drinking is done and travel both to and from the show. But as the debate rages on about the policies of a concert pavilion located 20 miles from the nearest Metro stop, this whole thing does strike me as one more reason to build venues like this closer to mass transit. Wise goes on to say that “The Capitals’ problem is not the coach” and that “the problem is the nucleus.” “The Caps’ flameout is an indictment on the Ovechkin era, not the Boudreau era,” states Wise at the close of the column. I honestly haven’t spoken with any Caps fans or read any articles yet that have leaned on Boudreau’s playoff winning percentage when debating whether he should stay or go—the discussion usually dives deeper into things like coaching style, power play performance and the ability to make adjustments, for example. A coach that wins a first round series 4 games to 1 and then loses in the second round 4 games to 3 leaves those playoffs with a winning percentage above .500. On the other hand, a coach that takes his team a round further, or all the way to the Stanley Cup Finals and gets swept there, could exit with a record below .500 for those playoffs. In general, I’d take a deeper playoff run over a higher playoff winning percentage any season. As Wise said, Scotty Bowman went 28-30 in the playoffs to begin his NHL career behind the bench, for a winning percentage of .483. But for the first three of those five playoff runs that got him to 28-30, Bowman took the Blues to the third round of the playoffs—which was then the Stanley Cup finals—all three times! His first three years behind the bench, three appearances in the finals. Bowman’s Blues lost in all three of those finals and the next year the Blues exited the playoffs in the first round (Bowman was only coaching the team for the last 28 games of that season and the playoffs—see the sidenote at the bottom for more on that). At that point, four seasons in, Bowman was 26-26 in the playoffs, with three trips to the Stanley Cup Finals. That’s a bit different than Boudreau at 17-20 after four playoffs, having exited twice in the first round and twice in the second. But it also doesn’t mean Boudreau won’t go on to win a bunch of Stanley Cups too. With Al Arbour, Wise says he started off 12-15. I’m actually not sure where he got those numbers—I can’t find any point where his playoff record stood at 12-15. But if you look at his first four trips to the playoffs, Arbour went 20-21. But the more critical information is that in those first four playoff appearances that got him to 20-21, Arbour took a team to the second round (which was the conference finals at that time) once and then to the third round (then the conference finals in the expanded playoff format) three times. Like with the Bowman example, Arbour’s initial playoff record of 20-21 is a bit different than the 17-20 record of Boudreau when you look beyond those numbers; winning percentage in the playoffs doesn’t tell how deep the teams went. Wise says Glen Sather was “a lousy 12-25 (.324)” but I’m not sure where he got those numbers from either. Even when I include Sather’s numbers via HockeyReference.com from when Edmonton was playing in the WHA, I can’t figure out when his record was 12-25 in the playoffs. But let’s just look at Sather’s first four playoffs coaching in the NHL, since Boudreau now has four of those under his belt. Sather went 18-15 with Edmonton in those first four NHL playoffs. He lost in the first round, lost in the second round and lost in the first round in the first three of those four—that’s exactly what Boudreau did with the Caps during his first three playoffs. And then during their fourth NHL playoffs behind the bench, both Sather and Boudreau saw their teams get swept. The difference: Boudreau’s Caps lost four straight in the second round to Tampa Bay, who are no doubt a very good hockey team this season that new GM Steve Yzerman put together after the franchise failed to make the playoffs for three straight seasons. 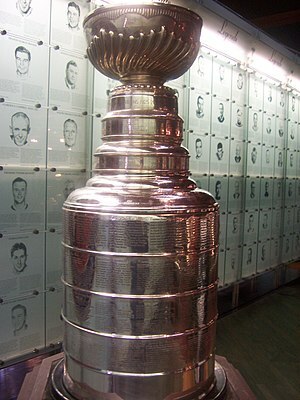 Sather’s Oilers fell in their sweep two rounds later than Boudreau’s Caps, to the New York Islanders in the Stanley Cup Finals, as the Islander dynasty won its 4th consecutive championship. Again, winning percentages don’t tell the whole story. Something else worth mentioning, Wise says Bowman, Arbour and Sather’s “respective teams hung on to those bums” after they started their playoff careers this way. That’s actually only true with one of the three. Bowman left St. Louis after four seasons. He won the first five of his Cups with his second team, the Montreal Canadiens. Arbour’s first playoff appearance was also with St. Louis and he later coached the Islanders where he won his Cups. Sather is the only one of these “bums” who was actually kept by, and won cups with, the first team he took to the playoffs. Bottom line, I wouldn’t use playoff winning percentage to measure a coach’s playoff success—there’s more to the story when you look beyond those numbers. I’m more interested in things like how deep a coach can take team in the playoffs and what a coach’s squad looks like during their playoff run, even in years when they fall short of winning the Cup. That gets me back to Boudreau. Do I think he should be fired? Maybe. But I think it should absolutely be on the table for discussion. And even if he sticks around and wins the Cup(s), I’d look back at this time and say it is right to be asking questions about whether he should be behind the bench next season. This has nothing to do with the fact that the Caps have not yet won a Cup under him or what his winning percentage has been in the playoffs. And it has almost everything to do with the uninspiring, lacking-in-urgency way I’ve watched his teams exit the playoffs for three straight seasons. First there was a Game 7 at home against Pittsburgh in the second round of the ’08-’09 playoffs that the Caps failed to show up for. The Caps lost 6-2 and I remember leaving Verizon Center, not so much feeling bummed that my team had lost but perplexed and wondering how you don’t get-up for a 2nd round Game 7 against a huge rival. That same quote from Laich would have been appropriate after some games during the recent sweep of the Caps by Tampa Bay or maybe even in ’09-’10 when they faced the Montreal Canadiens. (You could actually play a fun little game by going through quotes from the last three Caps playoff exits and guessing which one it’s from—sometimes it’s hard to tell, given the consistent not-hungry-looking-enough style in which they’ve been eliminated). In ’09-’10, the Caps were up 3 games to 1 on the Canadiens. Montreal was the 8th seed while Washington was the 1st seed, though seedings often don’t mean much to me once the NHL playoffs start. I thought Montreal could make for a tough first round series given the way they’d played the Caps during the ’09-’10 regular season, but I expected the Caps to win. And I certainly felt they should take the series once they were up 3-1. But they blew three straight chances to close out Montreal, two of them at home. This same “don’t seem to have it” type text from Burnside could have been used this year as the Caps were swept in the second round by the Lightning. I didn’t expect an easy series against Tampa Bay or to necessarily even win the series—they are a good hockey team and only finished four points behind the Caps in the regular season. But to be swept? There’s no way a team as talented as the Caps should have lost four straight to the Lightning. Mike Wise was right to place blame on “the nucleus” of the Caps team—Alex Ovechkin, Nicklas Backstrom, Alexander Semin and Mike Green—for the team’s playoff failures. But that does not mean the coach should be free of blame. It doesn’t have to be one or the other; both the players (the core ones and beyond) and the coaches can be at fault when things aren’t going well. And when the players repeatedly aren’t performing the way they should, there are multiple options: Finding a new coach or trading away key players are two of those the Caps organization has not yet tried in the Boudreau era. If I were the one making the decision on whether to keep Boudreau, I might be willing to give him one more season. And I wouldn’t need him to win the Cup next year in order for him to keep his job. But I would need to see a playoff team consistently showing they had grown and to not find the Caps doing post game interviews after their next exit from the playoffs that are hard to distinguish from the ones of the past three seasons. There’s also a part of me that thinks weak exits in three straight years is enough and that doesn’t want to take the chance we’ll be sitting in this same place next year, with another Boudreau-coached team that was unable to get motivated enough to put in a postseason effort they can at least be proud of. The Capitals organization undoubtedly has some interesting risks to weigh. Sidenote: If you want to read something nuts, check out this Sports Illustrated vault article from 1972 and an era when Bowman and Arbour had both been with the St. Louis Blues. The Blues owner makes it worth the read alone. And there’s a great story about Arbour and an incident in Philadelphia that fired up the Blues. It’s old time hockey.